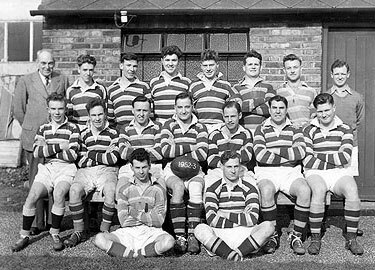 In an earlier article on the founding of the Old Wandsworthians’ Association and of its major sports section, the rugby football club, I set down the history as passed to me on my joining in 1946. I left the story at about 1950, with the club in its early seasons following the end of the Second World War. As I write, I have opened the fixture card for the season 1948-1949. It reminds me that, after the club had spent a brief time at Marble Hill, Twickenham, it had moved on to more permanent facilities. We were now in Hampton Court Park (known as Home Park), Hampton Wick. Directions are given in this fixture card as “Train (Southern Railway) to Kingston station, then 602 trolleybus (1½ pence) to changing facilities (and teas) at Kingston Baths. Ground in Home Park by Kingston Bridge”. By the end of the season, better changing facilities had been found at the White Hart public house facing the park and Kingston Bridge. Our one pitch in the park could be considered an “all-weather” facility, and was envied by all our visitors. It never got wet, never froze, despite the bitter winters, and never had long grass, thanks to the grazing animals – the deer, the sheep and the rabbits. We learned to keep our mouths closed when at the bottom of a ruck. Opponents found out the hard way when ingesting their first sheep dropping! KCS Old Boys, our neighbours on the adjoining and larger pitch, soon moved on to their permanent home. Thanks to Arthur Dicker caring for the park staff each Christmas, we were able to take possession of the vacated pitch. Until this good fortune, we were having difficulty finding a pitch for our burgeoning third XV and, eventually for the fourth team. In early and late season, we had coped by kicking off in our 1st XV or A XV game at 2:15pm, with the Extra A XV taking over at 3:45pm. This arrangement enabled our impatient junior team on the touch line to support us in the main game, and thereafter many a weary senior player stayed on to support the third team. As was the case with many a junior XV, the Ex A XV was likely to be short of a player or two, indeed so would be the visitors as well. Step forward Bill Forester, Tom Boucher, and myself among others, to offer our services to the Ex A XV, even to fill gaps in the opposition’s ranks. But the junior skipper would already have been alerted that he had a few 1st XV players to call upon. This enabled him to give, in an act of generosity (! ), one or two of his team to the opposition in a levelling-up exercise. To play in two successive games was becoming the norm for some of us during the early and late days of each season. We were now happily established in the changing facilities at the rear of the White Hart, albeit that they were on the small side. Mr Codrington, the proprietor of the inn, also provided the traditional rugby teas in his upstairs dining room, and was naturally more than happy that we chose to entertain our visitors in his lounge bar every long Saturday evening. Neighbouring us at the White Hart was a second park, Bushy Royal Park. During World War 2, it had been General Eisenhower’s headquarters (SHAEF) for the planning of Operation Overlord, the invasion of Normandy. In these early post-war years, it continued to be an American Air Force base. The White Hart lounge was a watering hole for some of the Yanks, and only their neater leisure-wear (British clothes rationing had only just ended in 1949), their hair style or their choice of music on the juke-box, marked out their presence. It was not long before the wartime alliance took a step closer when Bob Hubble, an American airman, took a shine to Stan Harrison’s sister, Margaret. She had a boyfriend, but we gained a running halfback who introduced the torpedo throw to Old Boys’ rugby years before Pete Dawkins made it famous in the 1959 Varsity game. There was now a feeling of permanence about our occupation of Home Park and the White Hart. We, however, still envied those clubs with ground ownership and dreamed of the day when we might become one ourselves. Soon after the cessation of hostilities in 1945, the School, the Staff, the Parents’ Association, the Lodge and the Old Boys had established a Memorial Fund to provide a permanent tribute to the fallen Wandsworthians. With the full support of the headmaster, H Raymond King, we of the Rugby Club were able to persuade the trustees to earmark the monies for a Memorial Sports Ground of our own. In these early years at the White Hart, we had the urge to broaden our social activities and thereby to raise still more money for the Memorial Fund. I had the dubious honour of being the first official fundraiser. In those days well before scratch cards, we sold football sweep tickets, punch boards (I won’t try to explain them!) and any other profit making gimmick. These helped swell the fund’s coffers which were growing significantly year by year, augmenting the monies accruing from the School Fetes. We were on target to achieve our ambition to play on our own sports fields within a decade. What was happening to the Wandsworthians on the field of play? Results were superb, particularly in the senior sides. 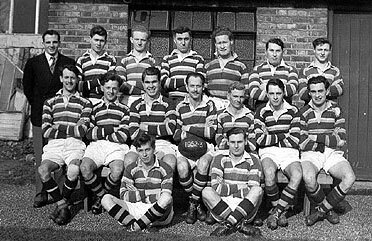 Membership grew steadily and a fourth XV soon appeared regularly. These factors made the Fixture Secretary’s job much easier, as clubs of a similar strength were pleased to offer us regular fixtures. We were now travelling to the Old Hertfordians, Old Westcliffians, Old Cantabrigians, Old Albanians, Old Dartfordians, Old Fullerians (Watford) and Barking Park OB. District and town sides were growing in strength alongside the Old Boys teams. Though our card was, in the main, populated with the Old Boys’ teams, we had about six fixtures each year with the district clubs. Staines became our regular Boxing Day fixture, kicking off at eleven o’clock! It was hardly worth going to bed on Christmas Day. Among other district and non-old boys clubs we faced were Chelmsford, Letchworth, Chingford, Slough, Warlingham, Mill Hill and 3 District Met Police. For most members, these early post war years were hard economic times. The migration out to a house in leafy Surrey with a car to cover the added miles was yet to arrive. Most players still lived in the boroughs close to Wandsworth School. And so journeys to the most distant clubs by coach became the norm, with Southfields Station or Wandsworth High Street our departure points. For a variety of reasons, matches in the near distant London suburbs were often journeyed to by London Transport. It would lead to a long day, leaving home at about 11.30 am. I recall the long walk to Southfields Station to be there by midday. Stan Harrison and Jimmy Lyon would be called for en route. After a half hour wait for stragglers and to sort out any last minute cry-offs, the bulk of the two teams left for a long, tortuous journey – for example, to Chigwell to face the Police District or the Old Cooperians. There was a benefit to be had from a virtually carless membership. We played as a team, we travelled as a team, and most returned late as the nucleus of the team that had left some eight or so hours earlier. Our return route would be via Waterloo to Clapham Junction so that we could join the patrons in the East Hill Hotel public house for a further couple of hours of carousing around the piano. No jukebox had yet reached this outpost. At 10.30pm – yes, that was “Time, gentlemen please!” in Wandsworth in those days – we ran for the 655 trolleybus to Putney to supper at Mario’s Italian restaurant. The last bus back to Wandsworth left soon after midnight, so another half an hour walk, still lugging a bag of kit, was the usual end to the long day. We knew that one day with car ownership, and with our own clubhouse as a magnet, all this would change, but in many ways would not be bettered. In this early post-war period we were well led by Reg Finch and then Ken Dore, newly returned after a spell with Richmond. Derek Finch, a strong captain, who had had a year in charge before a brief career move to Scotland, took up the reins once again. 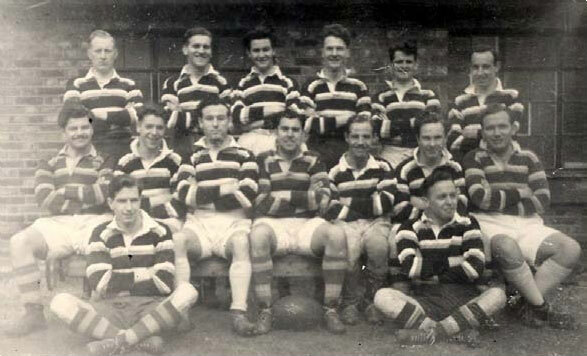 Strong players, such as Tom Boucher and Bill Forrester, ensured that the good results continued despite the strengthening of the fixtures. The junior sides were in the capable hands of the long-serving Peter Bull and Ron Duncan. Almost all of the members of the club had experienced life in the armed services, in the war or in National Service, and many in the wartime London. Their capabilities, thus learnt, ensured that we had a pool of talent that not only took us from a two team club to one of five sides, but, come the time, would plan and build a sports ground and its clubhouse with the minimum of professional help.